The pool industry is rife with buzzwords, many of them aimed at hyping new designs and features. One hot term that has been “bubbling up” recently is the spool or spool pool. As the name suggests, these trendy pools combine elements of a spa and a pool in one tidy little package. While spools can certainly save you space when compared to a more conventional swimming pool, they don’t necessarily save a lot of money. That’s because, unlike other pint-sized pools, spool pools typically have a lot of pricey features built in. In terms of ongoing costs, it’s also important to note the expense of heating what is essentially an over-sized hot tub. 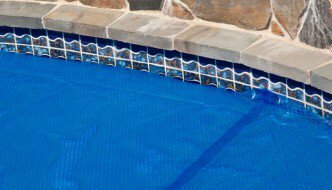 So, exactly how much does a spool pool cost to install and maintain? As always, it depends on the exact specifications – including all the bells and whistles that are common with this type of pool. How you use the spool is also a big factor in determining the total cost of ownership. But those are just the basics. Spools also commonly include things like waterfalls, LED lighting, ornamental decking, and other high-end features. In fact, many people go for the full “cocktail pool” experience with fire bowls, poolside bar, outdoor kitchen – you name it. Sensing a trend here? One of the main attractions of spools is that they allow you to invest space and money in extra features that turn your backyard into a miniature resort. Of course, all that luxury comes at a cost. For those who just want to know how much spool pools cost, there is unfortunately no one-size-fits-all answer. In addition to the different features mentioned above, there are also the usual inground pool cost variables such as materials (fiberglass spool, anyone?) and builder pricing. The only way to get meaningful spool pool pricing is to contact builders in your area. Get quotes from at least three contractors, keeping in mind that the lowest offer isn’t always the right one to accept. The ideal spool builder should not only come in with an affordable bid, but have an impeccable reputation and experience installing inground spas. With their impressive versatility and stylish looks, spool pools are more than just a passing fad. They represent a sensible option for people who don’t have the space or budget for a full pool/spa combo. However, if you’re looking for a truly economical choice, make sure you understand the full cost of owning a spool – you might not like what you find when you test the waters.